We made it to Galapagos! The following day we got onto the plane that brought us to Baltra island, one of the Galapagos islands and the island where the main airport is located. After paying the 100 dollar park fee you take a bus, boat and bus again to get to the main town on Santa Cruz island: Puerto Ayora. Along the way you could already see you landed in the Galapagos: giant tortoises everywhere! Puerto Ayora is quite a cute town with lots of shops, restaurants, hotels and tourist offices. We only booked a hostal for one night, because our plan was to look for a last minute cruise. After checking into Hostal Vista al Mar, we went into town to look for a good deal. Our preference was to get on a cruise that goes to places you can’t really reach easily during day trips. We also preferred to go onto a cruise for 8 days since we have 10 days to spend here anyway and thus have the time. And we wanted to have a small boat, with a maximum of 16 passengers. After comparing a couple of companies we found one deal for 1500 dollar per person. Still not cheap, but the itinerary is exactly what we want, spread over 8 days. And normally this cruise would cost 2600-3000 dollar per person, so still not bad :). The cruise will leave today (Thursday), so this gave us one day for sightseeing on Santa Cruz island where we are staying. Yesterday morning we first walked towards the Charles Darwin Foundation center. In this information center is a lot of information about all the different research the foundation does to make sure the Galapagos islands with all its special flora and fauna are preserved. There is also a tortoise breeding center with lots of giant tortoises. Along the way we made a stop in the little fish harbor of the village. The pelicans and sealions know where to go for some fish leftovers! The hostal where we stayed was fully booked for the the following night; therefore we changed to Hostal Morning Glory. This hostal is actually really nice and I can definitely recommend it! Huge clean rooms and a very nice garden with hammocks to relax. 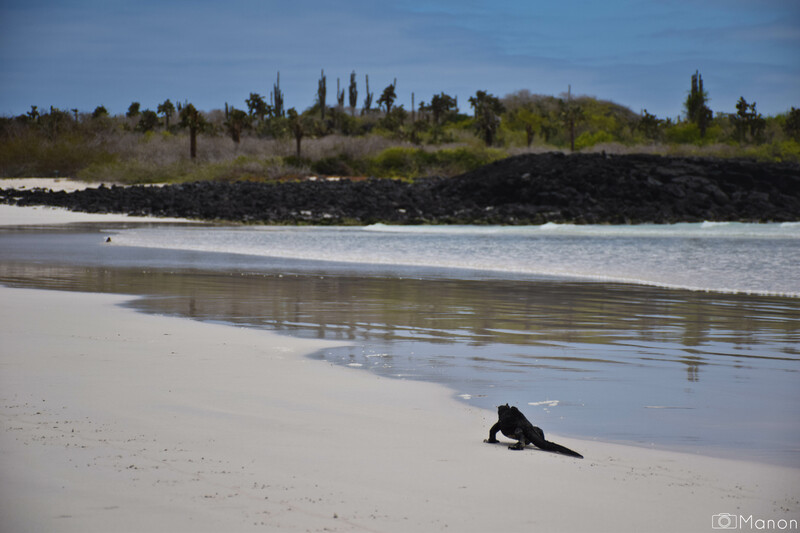 Then we walked to Tortuga Bay, which is one of the largest beaches in the Galapagos Archipel. It’s a bit of a walk to get here from the town (2,5km), but we were rewarded by a very beautiful white beach full with iguanas, and further down a calm laguna perfect for swimming. This is where we spent most of the day relaxing in the sun. Goed te lezen dat jullie genieten,prachtige natuur,groetjes van Kees en Erica. Een goed begin is het halve werk! Leuk en mooi hoor en veel plezier op de cruise.